Last week I got everyone real angry about Legacy. I failed to clarify one particular point though, which I’ll start with today. When I implied that Legacy was going to fade away I wasn’t explicit about what that meant. It doesn’t mean nobody will play the format anymore. I expect it to eventually end up as Vintage is today – enjoyed by a core group of dedicated players, occasionally responsible for odd cards being hilariously expensive, but overall not something most players concern themselves with. People will still have their pet decks and Legacy events will continue to fire at local stores and Grand Prix side events. But there will come a day when SCG no longer runs it as a major event at opens and you can no longer win Pro Tour invites playing the format. That is the eventual fate of Legacy, not a total abolishment from the minds of mortals. Kyle Boggemes took down the whole event with a soup du jour Esper control list. The first thing that jumps out at me is the full twelve Scrylands. If you haven’t figured it out yet, these are powerful lands that are going to be relevant for their full course in Standard. What’s most interesting is how resilient the prices have been on the Theros lands. Typically we see the current fall-set lands get quite low. The Innistrad checklands behaved this way as well. These seem to have kept their prices a little better than I anticipated, with the exception of Temple of Mystery. Their floor will be between May and June, so whatever they fall to, that’s as low as they’re going to be. Three Elspeths is also worth noting, and she’s been prevalent in many of these lists. Her price continues to be a stubborn $20, which is impressive for a fall Planeswalker. If she gets below $15, I’d start trading hard for her. We will definitely continue to see her after rotation. If you haven’t moved your Desecration Demons, Nightveil Specters, Underworld Connections, or Pack Rats, get on that soon. Their peak has come and gone. A playset of Herald of Torment showed up in the Top 8, which is good news for his long-term prospects. He’s still about a dollar, and could pretty easily climb to $3+, maybe even $7-$10 depending on how things shake out. I haven’t bought any myself, but if I could get twelve or more copies for $1 each shipped, I would. We’ll still have Bile Blight, Hero’s Downfall and Thoughtseize after rotation, which basically guarantees he’ll always have a shot at being good. I’ve been wondering if you could actually build a Hero of Iroas deck with Fabled Hero, Agent of the Fates, Herald of Torment, and Nighthowler. It’s probably an FNM deck, but it sure sounds fun. As I warned, Pain Seer is down to under $1 at this point. She’s a pretty low-risk pickup, but I like her less than I like Herald. She’s just so much more conditional than Herald is. Naya Auras made the Top 8 as well, but there doesn’t seem to be a lot there we can work with. Most of the deck is rotating soon. I do see a whole lot of Scrylands though. In the Top 16, Adam Jansen showed up with three copies of Ashiok. I still am a fan, and while Ashiok hasn’t been tearing up the tournament scene, at least s/he’s putting up occasional results. As a $7 pickup, you can’t really go wrong. I’d be surprised if s/he didn’t end up north of $10 at some point this fall for at least a slim period of time. Ari Lax was the darling of Cincinnati, piloting a GB “dredge” deck. He had some hot cards for sure. I was about to start listing the cool creatures he was playing but then I realized it was basically just all of them. I don’t think we’ll see Jarad make any moves, as the Duel Deck made sure that even if he’s playable there will be plenty of stock to go around. If you don’t have your Nighthowler promos yet, grab them now. The card is definitely powerful enough, and the full art version is leagues better than the pack foils. What may be the most interesting card here is Satyr Wayfinder. While he isn’t going to be a $4 common, this list is proof that he is definitely capable of helping enable an archetype. 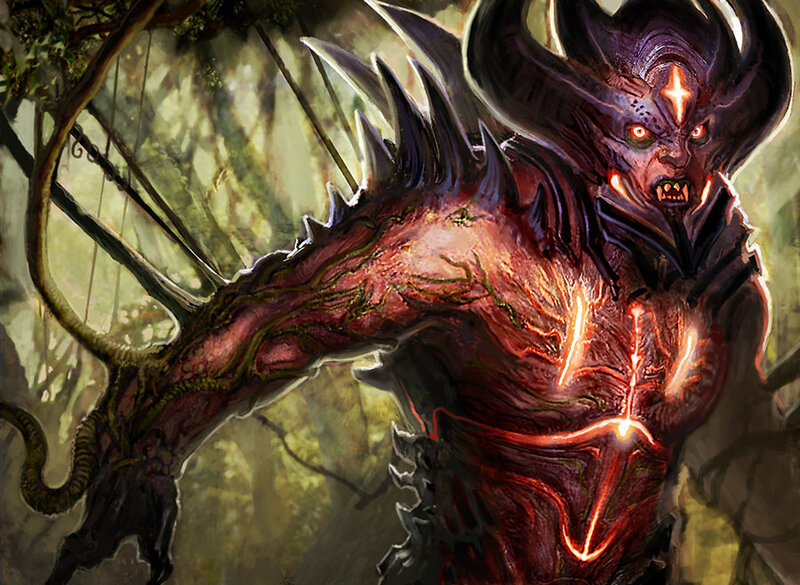 Be on the watch for more graveyard-friendly cards and strategies in Journey and M15. Whip of Erebos will be around this September as well. The seeds are sown for a graveyard deck. The question is whether or not Wizards will make it rain. While Cincinnati certainly drew the biggest Standard crowd this weekend, there was in fact an SCG open as well. I see Courser of Kruphix in third place, and I notice his price is nearly $10. This guy is definitely legit. Expect to see plenty of him next year as well. He’s a Born of the Gods rare, which is good for his longer-term prospects. $10 is a tough point of entry, but if he slips this summer, jump on that. Cliff has talked about it before, but I want to refresh your memories here. I recommend you read his article, as it’s digestible and useful. The tl;dr is that the draft format means that we are going to open way more Theros than either of the other two sets, and less Journey than either of the other two. This means Theros cards are the weakest in terms of speculation value, BOG cards will be acceptable, and Journey cards will be ripe for unexpected spikes. It’s tough for me to recommend going deep on any almost anything in Theros, but I think BOG should have a low enough print run that it’s safe to expect movement. Journey will be your best bet, but we aren’t quite there yet. I’m not saying that it’s impossible for Theros cards to spike, just that there will be less of them, they’ll be harder to identify, and they may not go as high as you’d like.